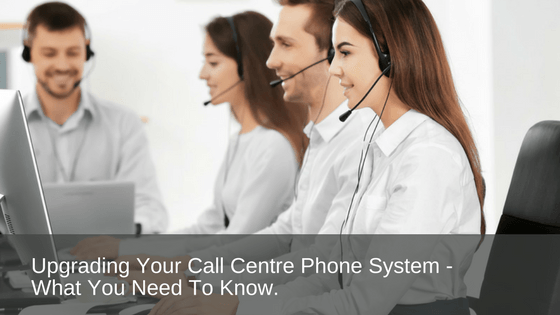 We know that call centres can be anything from an intimate number of staff to a multinational corporation which houses hundreds of call centre operators. But, no matter the size of your call centre team, the business phone system you have must work seamlessly with your team to increase revenue for your business. Business telephone systems are the gateway to what lies beyond your bricks and mortar and an efficient telephone system can make all the difference to your bottom line. A good business phone system can reduce the time between calls and increase the productivity of your call centre. So, what should you really look for when you are considering an upgrade to your call centre phone system? With technology advances these days, you have the flexibility of choosing between VOIP call centre systems or analogue telephone systems. Each of these systems have their pros and cons which we will run through briefly below. The most effective way to determine which telephone system is best for your business is to create yourself a checklist. You can use this checklist to provide information to our business phone system specialists who can provide expert advice and assist you further. How many phones does your business need? How many staff will need to use the phone system at the same time? How many international calls does your business make and how regular? Do you have multiple sites, remote teams, or staff on the road? Do you have any plans to increase the number of staff within your business in the next five years? Do you have more than 50 people at any one location? Have you thought about disaster recovery or a business continuity plan for your telephone calls and phone lines? Do you have a large bandwidth requirement that could be divided between voice and data to reduce the cost to you? How many people in your team are IT-savvy or IT professionals? Do you store contact information on computer applications? What is your budget for your call centre telephone system upgrade? What is the set up of your current cabling? Are there lines that run to every desk in the office? What is the ratio of your business’s inbound and outbound calls? Are you planning to relocate or upgrade your premises in the next five years? Are there any problems you experience with your current telephone system? What are your installation and maintenance preferences for your new telephone system? Have you given preference to onsite or offsite hosting services? Is there any particular functionality that you require or like? For e.g. call monitoring, call recording, greetings per time of day, etc.? When considering an upgrade to your call centre phone system there is no right or wrong business phone system, nor one that is more beneficial than the other. The best phone system depends solely on your individual business needs. Prepare your checklist then contact our expert team so we can recommend the best business phone upgrade for your requirements. If you would like more information or need help in deciding on the best business communication system for your business, contact us today for expert advice – call 1800 007 229 or visit www.prosum.com.au we’d love to hear from you.